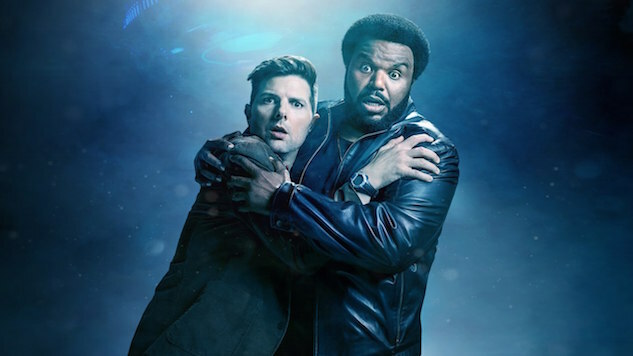 Fox’s latest live action comedy has the potential to be a whole lot of fun during its first season—assuming the creative team can continue to develop the excellent chemistry between leads Craig Robinson and Adam Scott. The series focuses on two lovable losers who are recruited into a super-secret government program to investigate everything from ghosts to UFOs to alternate dimensions. Robinson plays ex-cop Leroy Wright, while Scott takes on disgraced professor Max Jennifer. The hapless duo is called up when a missing agent of the paranormal-focused Bureau Underground asks for their help in his final message before disappearing. Leroy and Max don’t know each other, or about the existence of the Bureau Underground, so their introduction to the world of the paranormal is quick and dirty, with the two kidnapped and briefed in the opening minutes of the pilot. A short time later, they’re hitting the streets and on the case. Sure, you have to suspend your disbelief at its speed and silliness, but Ghosted wastes no time with formalities—and it’s probably the better for it. Thanks to the Bureau Underground, it has a premise that allows it to explore pretty much anything weird or wild from week to week. Hopefully, that’ll keep the concept from going stale any time soon. Tonally, the series is the hilariously weird love child of The X-Files, Ghostbusters, Fringe and Community. Imagine throwing all those things into a blender, and something like Ghosted might be what you dump into your smoothie glass when it’s all said and done. The show has a bit of a horror spine tying it all together, and though the juxtaposition can get a bit awkward at times, you can see the potential for how this show could work once the narrative heavy-lifting of the pilot is complete. If Ghosted has one major fault, it’s just how quickly it throws these two into the deep end, trying to walk the tightrope of being a straight-up comedy, a sci-fi series and a jump-scare thriller all at once. Their introductory briefing, in which Captain Ava Lafrey (Ally Walker) gives them a primer on the Bureau, hits a few jokes and breaks down the its mission with a few gags; mere minutes later, Leroy and Max are in the middle of a shootout holding a detached human head. It’s a lot of genre mashing, and with the pilot already trying to lay the groundwork for the premise, it’s all rather rushed and overstuffed. Thankfully, Robinson and Scott are funny enough to (mostly) make it work. The duo do an excellent job carrying the premise, cracking jokes and taking shots at one another every step of the way. In its bones, Ghosted is a vehicle to put these two in crazy situations, and it succeeds perfectly in that respect. From jokes about Max’s wife being abducted by aliens to playing hot potato with a severed head that won’t stop screaming, Ghosted brings the absurdity by the bucketload, and these two are right at home in the material. Between’s Scott’s tenure on Parks and Recreation and Robinson’s stint on The Office, they’re two of the funniest actors of the past several years when it comes to TV comedy. Put simply, you could tune in for just the two of them and you’ll still be getting some good laughs. But it’s not all sight gags and secret missions. The aforementioned severed human head brings some freaky visuals along with it, while the pilot’s final scene of the provides an intriguing twist that ends things on a far more sinister note than one might expect. It also leaves more than a few mysteries and big sci-fi ideas dangling, potentially setting up some season-long arcs. Ghosted looks to dabble just enough in X-Files-style darkness to give it some edge in the increasingly crowded comedy landscape. Stack that against the humor and the talent, and it looks to be a winning formula. The series is only the latest oddball half-hour comedy pitch from Fox, following the short-lived and surprisingly funny Making History last season. That Adam Pally vehicle, about an average Joe with a duffel bag that allows him to travel to the past, also took a high-concept swing, but failed to find an audience. Here’s hoping Ghosted has enough star power to stick around—because it has the potential to be scary good. Ghosted premieres Sunday, October 1 at 8:30 p.m. on FOX. Trent Moore is an award-winning journalist and professional geek. You can read more of his stuff at Syfy Wire, and keep up with all his shenanigans @trentlmoore.